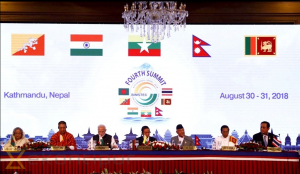 The fourth summit of the Bay of Bengal Initiative for Multi-Sectoral Technical and Economic Cooperation (BIMSTEC) has kicked off at Hotel Soaltee in Kathmandu (Nepal). Nepalese Prime Minister KP Sharma Oli, Indian PM Narendra Modi, Thailand PM Prayut Chan-o-cha, Bangladeshi PM Sheikh Hasina Wazed, Myanmar’s President Win Myint, Chief Advisor to the Interim Government of Bhutan Gyalpo Tshering Wangchuk and Sri Lankan President Maitripala Sirisena are attending the summit began on Thursday. PM Oli is scheduled to address the summit for 22 minutes and the heads and representatives other member states will address for 15 minutes each after him. Around 30,000 security personnel from the Nepal Army, the Nepal Police, the Armed Police Force and the National Intelligence Department have been deployed, in uniform and regular civil attire, to guard the summit. This sub-regional organization came into being on 6 June 1997 through the Bangkok Declaration comprising seven member states. Five of them — Bangladesh, Bhutan, India, Nepal and Sri Lanka — are from South Asia and two — Myanmar and Thailand — from Southeast Asia. The objective of building such an alliance was to harness shared and accelerated growth through mutual cooperation in different areas of common interests by mitigating the onslaught of globalization and by utilizing regional resources and geographical advantages.